Outdoor furniture must unfortunately contend with all of the glorious filth that nature has to offer. That includes your standard bits of dirt, mold, fungus, mildew, animal droppings, rain damage, spilled food, and more. All of these things can cause your furniture to deteriorate pretty quickly. Outdoor chair cushions and fabric furniture covers can get ruined. Wood and wicker patio furniture can wear away or rot. Your metal patio table and chairs can rust. It’s important to take a few important steps to prep your furniture before you start cleaning. First, consider the area around the furniture. If the furniture is around anything that might get damaged by cleaning materials, try to move it to an area where any potential accidents (such as splashing bleach) won’t be an issue. Next, think about what’s on the furniture. If it’s dirty with loose materials, shake or brush off any loose dirt or leaves before you begin using any cleaning products. Different furniture types and materials will likely have different cleaning requirements. A metal patio table and chairs are not going to get the same cleaning as outdoor chair cushions. You will need to separate the different pieces that compose your furniture and clean separately together based on their material, e.g., removing cushions and cleaning them apart from the wicker or wood structure. With these steps taken care of, you’ll be ready to begin the cleaning process. With your outdoor furniture cushions and other types of fabric furniture, there’s only one hard rule here: do not use bleach or cleaning materials with bleach on colors. You may even want to be cautious when using anything with bleach in the ingredients on whites, as the white fabrics are at times not a true white. Unless you fully intend to keep your outdoor fabrics a bleached white, avoid this cleaning material altogether for fabrics. In a bucket of warm water, mix in about one tablespoon of dishwashing liquid. 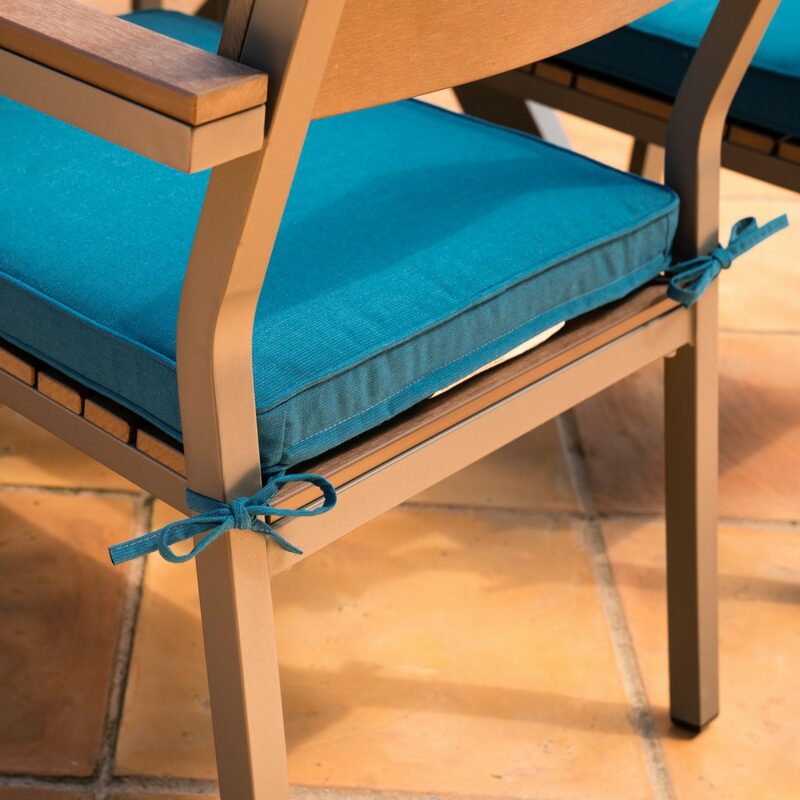 Given outdoor chair cushions can have significant mildew buildup, you may need to add in one-quarter cup of Borax into the mix as well (only add the Borax if it’s necessary). The dishwashing liquid and warm water will do. You’ll want to soak each cushion in the warm water mixture for about 15 minutes for each cushion. 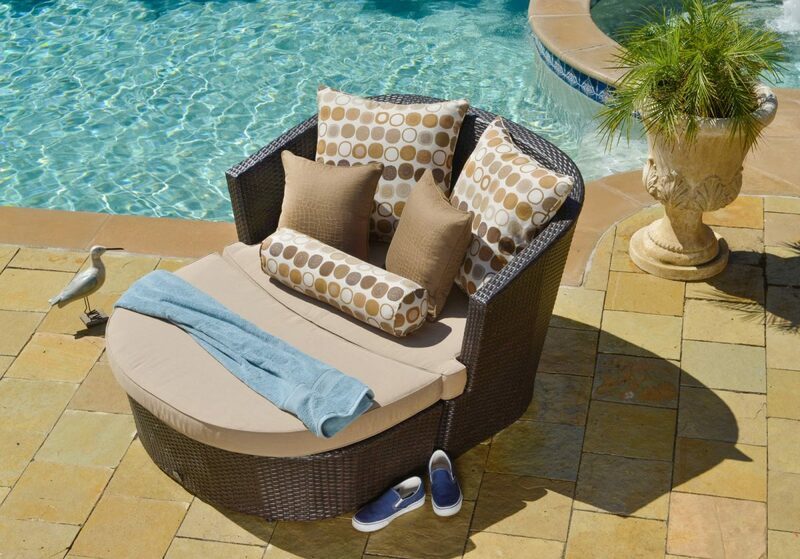 Make sure to dry the outdoor furniture pillows and cushions properly. Once you remove them from the water, towel dry them as much as possible or use a hair dryer. Leaving them wet to air dry can result in mildew buildup. If your cushions have fabric covers, unzip or remove the covers and run them through the clothes washer. Any other loose fabric covers can be run through the clothes washer as well. Have stains? Try a fabric stain remover. Just be sure the fabric stain remover is designed to avoid changing the color of your fabrics. 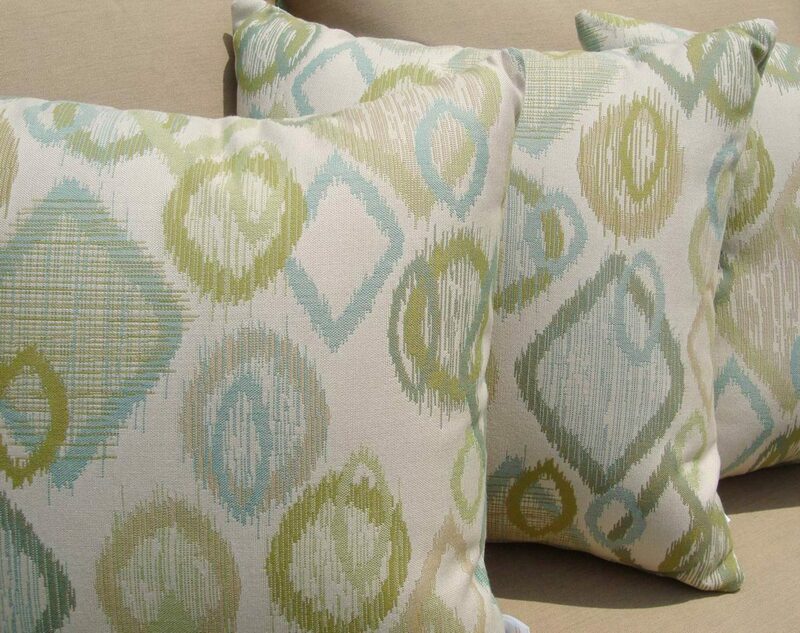 Before replacing your cushions, and after they’ve finished drying, spray them with a fabric protector. This will help make the cushion water and dust resistant, at least to a certain degree. You’ll want to treat your canvas outdoor furniture similarly to your fabric, keeping in mind that canvas is just another type of fabric. The bleach rule still applies here as well. You can use the same cleaning ingredients from the cushions and fabrics, although may also want to include the Borax even if you’re not dealing with mildew. Canvas can be a bit tougher of fabric so a slightly stronger cleaning material might be necessary. Once you have your materials together and well mixed (one tablespoon of dishwasher, one-quarter cup of borax) completely soak your canvas furniture. It should be soaking wet for this. Then, take a scrub brush and scrub the material, although avoid scrubbing too harshly so as to avoid wearing away the fabric. As with the other fabrics, make sure to spray a fabric protector on your canvas. This will add the same water and dirt resistance. If you have canvas furniture that is small enough, you may be able to machine wash it. If this is not possible, however, the above methods will work just as well. You can clean your outdoor furniture with a simple dishwasher and warm water mixture. A nice sponge can clear of most dirt and grime. Anything stuck on can be cleaned off with a soft scrub brush. Avoid using a brush that’s too coarse to avoid accidentally removing any of the paint. 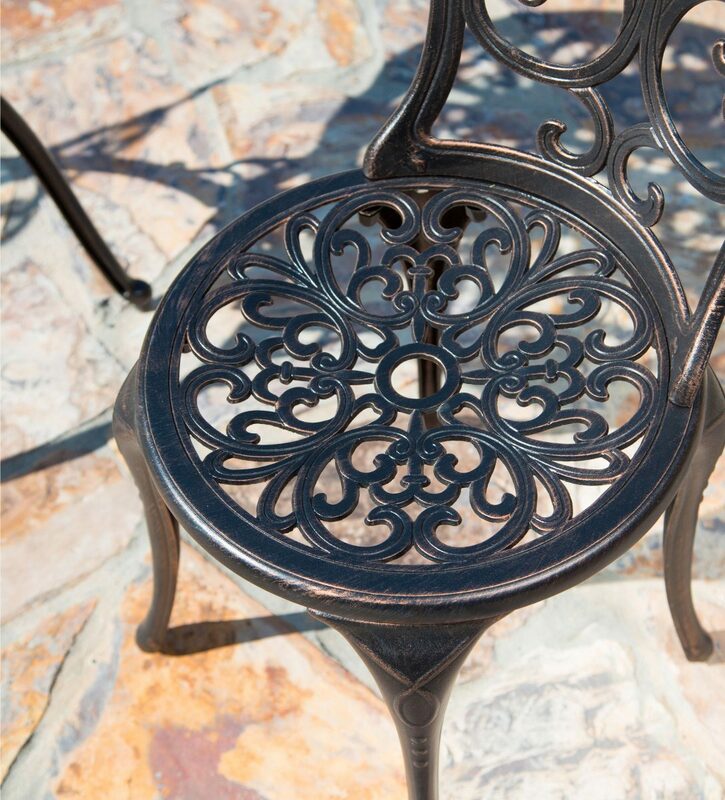 If you want to protect your metal patio table and chairs against getting dirty or developing rust issues, consider a new coat of rust-resistant paint, or invest in a good cover for the table and chairs. However, you may also want to consider a paste wax that will help prevent rust as well. How you deal with your rust will depend on just how heavy the rust is. For light rust, you’ll only need to use the steel wool or sandpaper. You’ll need a bit of elbow grease, but brushing the rust away will help. There will be some residual rust, but you can protect that area by covering it with some rust-resistant primer and then rust-resistant paint. For medium rust, use the steel wire brushes, as these will give more purchase against the tougher levels of rust. You’ll also need to look for bubbles in the furniture, an indication of rust sitting under the paint. If you see those areas, you’ll need to use the paint scraper first and then address the rust. For heavy rust, use the same method as with medium rust. However, you’ll likely need to scrape away far more paint, spend much more time and effort scraping the rust away with the steel scouring brush or coarse sandpaper, and will almost certainly need to use either the rust removal liquid or the home-made acidic mixture, as well as the naval jelly. Note that you might need to repaint the rusted outdoor furniture piece, especially after addressing heavy or medium levels of rust. If you do plan to repaint, include the commercial rust-removal product into the mix before repainting. You’ll also want to use the rust-proof primer first, and then apply the rust-proof paint. You may need the mineral spirits due to the oil-based rust-resistant paint. Wicker, in particular, can be far harder to clean due to the way it’s designed. 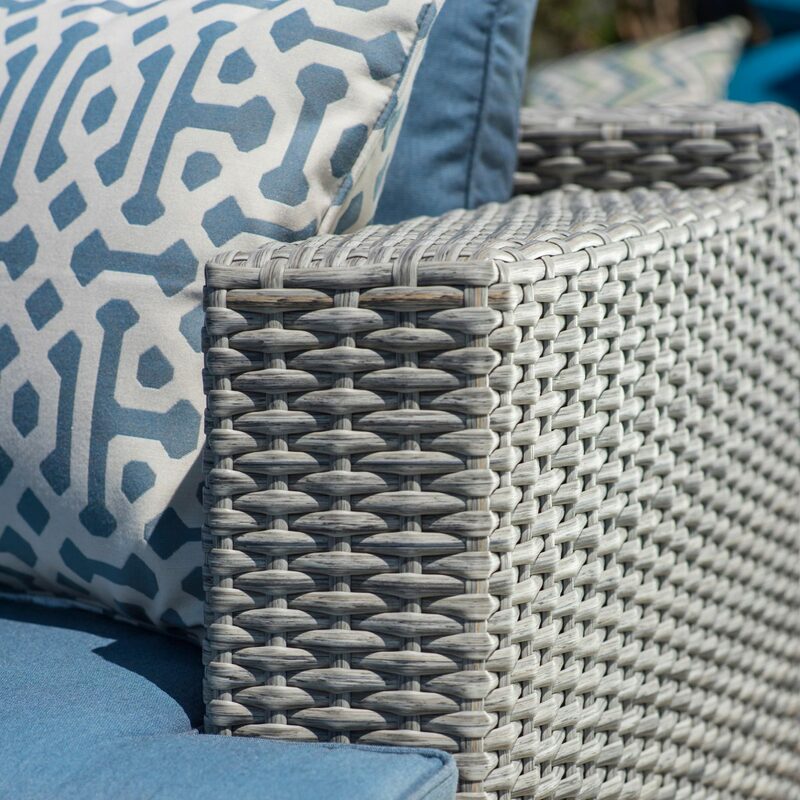 For most purposes, the easiest way to clean your wicker furniture is to use a wet microfiber cloth and rub away any dirt, dust and grime. No cleaning liquids or chemicals are needed for most cleaning. You’ll also want to dust your wicker furniture regularly and ensure you get in the cracks of the furniture. A well-dusted wicker piece will look great and last for years. However, if your wicker has more serious cleaning needs, you may need to use the mild soap in the water to help remove tough spots. If you have a mold or mildew problem, however, you’ll want to consider a water mixture with that’s about one-quarter water, one-quarter vinegar. The acidic nature of the vinegar-water mixture will clear away the mildew. Unfortunately, there’s no good way to effectively prevent mildew buildup on your wicker furniture outside of regular cleaning. Try to keep your wicker on a twice-a-year cleaning schedule for mildew cleaning, with more regular dusting and softer cleaning with the microfiber and warm water method. There are different ways you can clean your wood. If you prefer to keep it simple, you can just use a commercial wood cleaner, following the directions on the bottle to ensure effective cleaning. For a more DIY method, consider a mixture of ammonia (one-quarter cup), vinegar (two tablespoons) and warm water (one quart). Clean the wood furniture with a soft cleaning brush or sponge, ensuring you are wearing gloves. However, this method is only effective if your wood’s finish is still in good condition. If your wood’s finish is wearing off or completely worn off, you may risk damaging the wood. The best way to protect your wood furniture is to use a good finish. If your furniture needs to be refinished, consider purchasing a wood finish for outdoor furniture and following the directions to refinish the wood. You might be surprised by just how versatile your plastic furniture can be. Left alone, most plastic furniture primarily suffers sun damage more than anything else, although plastic is vulnerable to mold and mildew as well. Cleaning issues are fairly simple to take care of with common cleaning methods and materials. To clean your plastic furniture, simply wet your sponge, sprinkle on baking soda, and wipe the furniture down with the sponge. The baking soda acts as a mild abrasive and a very mild cleaner. If you want, you can also use a dishwashing liquid and a soft scrub brush for more significant cleaning issues. Spray the furniture down with a garden hose when you’re done scrubbing. Mix either a one-to-four parts bleach and water solution into the spray bottle, or a mixture of one-quarter cup vinegar to a quart of water for color plastics. Spray the mixture on the furniture and allow it to set for 15-20 minutes, then spray it down with a water hose. There’s little you can do to protect your plastic furniture beyond regular cleaning or covers, but you can restore its shine by applying automotive paste wax. Follow the instructions on the paste wax for maximum effect. Mold is a distinct problem for outdoor furniture. Most of the cleaning methods listed above will help get rid of both mold and mildew, so there’s no need to follow any extra methods beyond what is given above. 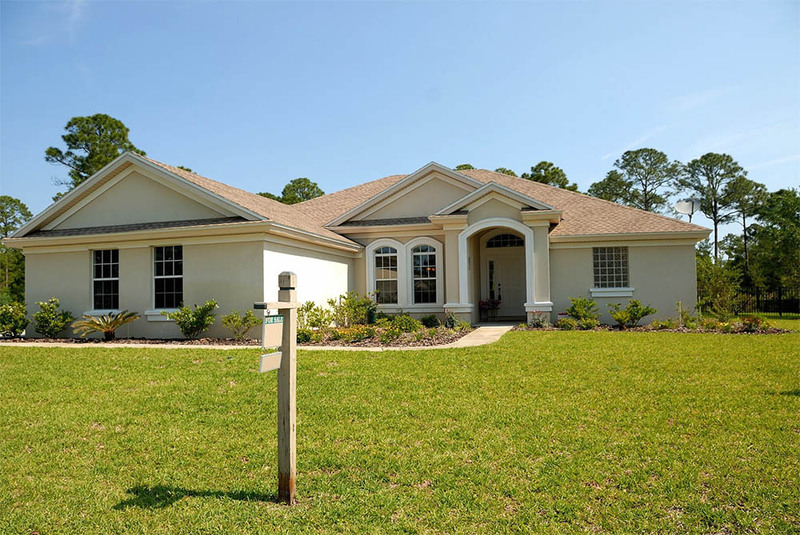 However, there are some things you’ll want to understand about mold when attempting to clean it, and some things you’ll want to avoid doing when trying to clear it away. Mold is a type of fungus that grows in consistently damp and moist environments. This means that if you see mold on your outdoor furniture, you may have a problem with that furniture staying too wet too consistently. You may need to move the furniture into a sunny spot, or be more active about removing cushions during rainy or wet outdoor conditions. Any acidic cleaner will clean off mold effectively. That includes bleach, ammonia, vinegar, detergents, borax and the like. However, and this is of utmost importance, NEVER MIX BLEACH AND AMMONIA. Some cleaners are fine to mix, but these two should never be combined. Mixing bleach and ammonia creates an extremely toxic form of chlorine gas, similar to what is often used in some chemical weapons. It can damage your lungs and create a burning sensation for your eyes. When cleaning mold, it may be a good idea to use a simple cleaning mask and gloves. The cleaning materials may be tough on your hands, while the mold may be a toxic form that can cause breathing problems if the spores are breathed in. 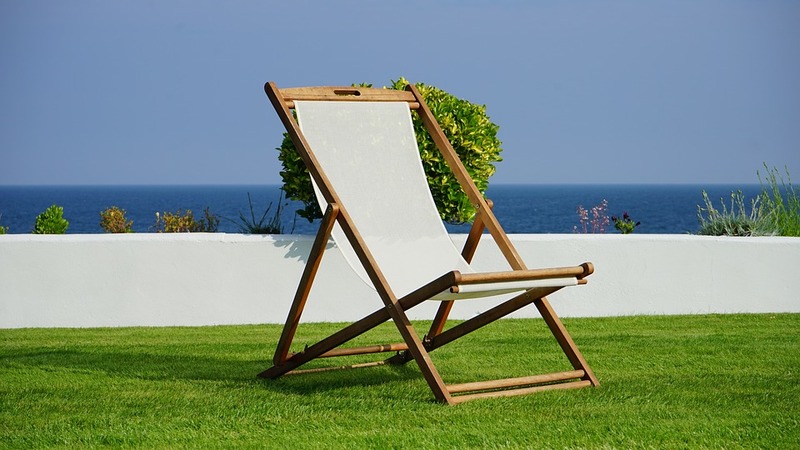 To prevent mold buildup in the future, make sure you keep your outdoor furniture dry. Moving the furniture regularly can also help prevent mold buildup. Again, also make sure your furniture with outdoor furniture covers and fabric pillows or cushions are kept try. It may be wise to remove covers every now and then to let any trapped moisture dry out. There’s a good chance you won’t be using your furniture year-round. Protecting your furniture properly is essential to guarantee long-life and to avoid many of the cleaning issues we’ve discussed above. During winter, try to keep your furniture stored in a garage or shed area. A garage is preferable as it will offer some protection against the cold, although that may not always be possible. A shed will help protect the furniture from snow, ice, and rain. If you don’t have any indoor storage space, you can also opt for heavy duty outdoor furniture covers. As previously discussed, avoid keeping fabric furniture out and open in wet weather. Bring cushions and outdoor furniture covers that are made of fabric indoors or place them in a shed or garage. If they do get wet in the rain, remove covers from pillows and run them through the clothes dryer, and allow cushions and pillows to air dry in the sun. Furniture still not clean enough? Cleaning your outdoor furniture can help make sure it lasts for years. 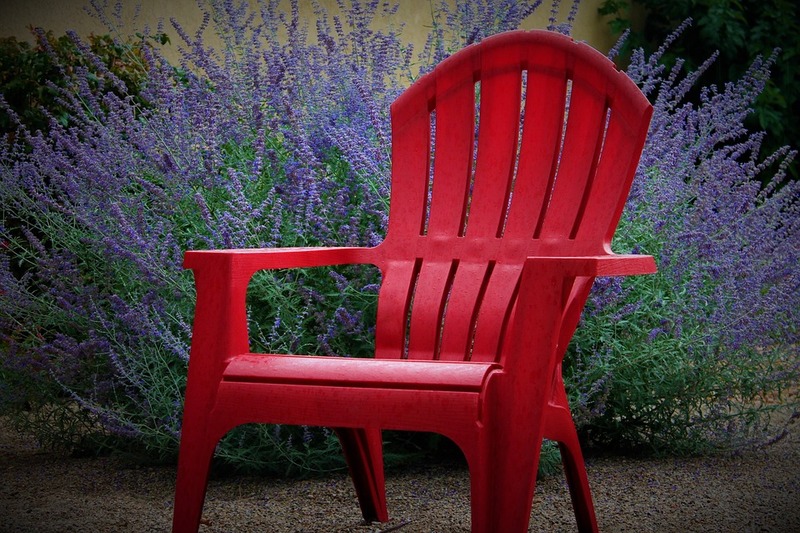 However, there may come a time when your outdoor furniture pieces are beyond restoration or repair. If you think your furniture has been so damaged by the elements that it can’t be saved, don’t hesitate to update the furniture sets. 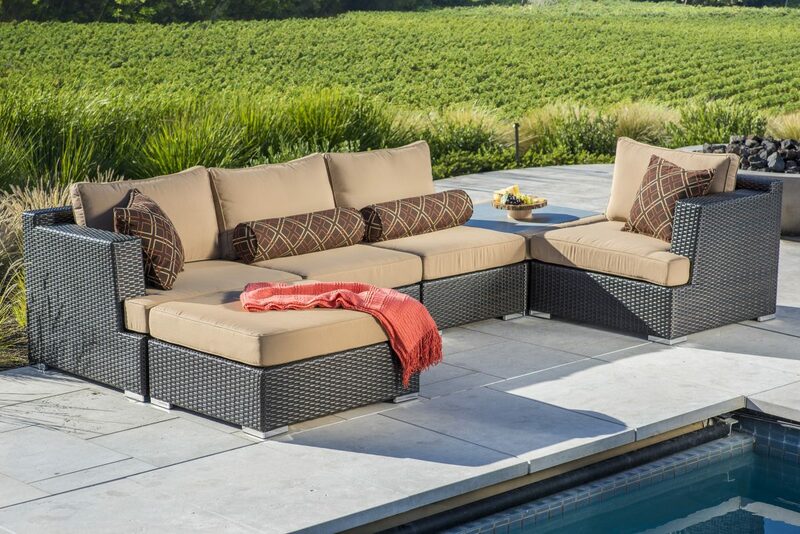 You can find new, quality outdoor furniture pieces at an affordable price, and reimagine your outdoor space into something new.